By now you should have completed the following steps. Add all your stock to the main e-commerce database. 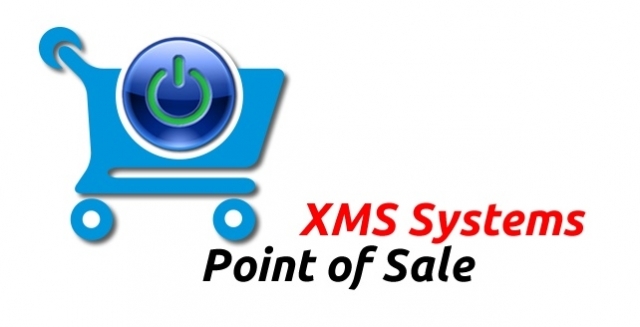 The next and critical part is to allocate and manage the stock for each POS location. Managing your stock is one of the most critical steps of setting up and using your POS. Remember the old saying "Garbage in, Garbage out". Managing your stock accurately is absolutely critical if you want accurate sales, sales reports and be able to make accurate projections. There are 4 buttons to manage your stock per location. Click the purple stock button to manage every aspect of the stock allocated to this location. Min is the absolute minimum number of this stock item you need to maintain a working POS Location. Bar Code to print a barcode for this item only. Useful if adding a new stock item at this POS location. Edit selected Items to edit the items you selected by ticking the tick box all at once. Start typing the SKU or item name to filter the stock items added to your website. If an item has already been added to a location, the location name will be displayed in brackets. To add the same item to a different location, selected the same item again. 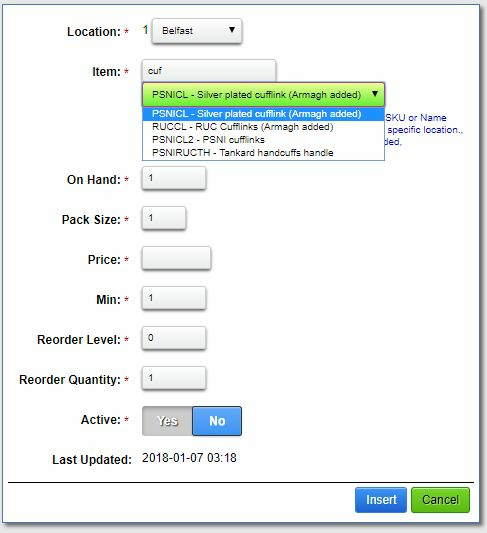 If a stock item has been added to more than one location, the item will be displayed once for each location. In our example, we want to add the silver cufflinks to the Belfast location. 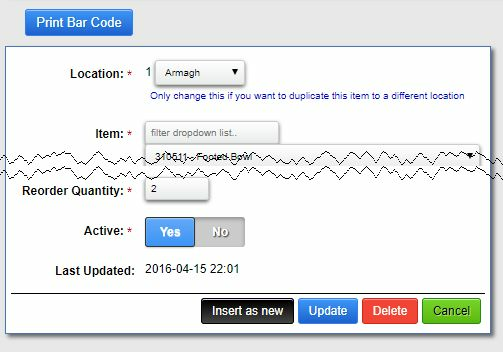 You can see it is already added to Armagh, Select the same item again and it will be added to Belfast. Pack Size: The number of items you have in a pack, If you receive this item in a pack of 5, add 5 into this field. Price: Enter the selling price in the currency you will be selling in at this location. Minimum: This would be the absolute minimum number of items you can have in stock. If you have a pack size of more than one, this would be the minimum number of full packs you can have. Reorder Level: This would be the stock level/packs at which you going to reorder again. Reorder Quantity: This would be the number of items/packs you going to reorder. Active: Yes/No. Set this to “No” to stop selling this item. If you going to edit an item, you not only have the option to update the different option, you can also “copy” the item to a different location. Price: Update the selling price as required. Remember to adjust for the currency in use at the location. Minimum, Reorder Level and Reorder Quantity can be a bit confusing. So let's discuss this options. Let's say you have an item that sells well, you want to make sure you always have enough stock on hand to be able to satisfy your customer's requirements. The first thing you need to figure out is at what level you going to order more stock. Keep in mind the factors outside of your control like the lead time required at your supplier as well as the delivery time by your courier. The next thing you need to figure out is how much you need to order. You do not want to order too little or too much. Either way, it could cost you money. If you order too little, you might need to reorder to soon again. That could cost you extra in transport. Order too much and your stock might become “old” before you can sell it all. Consider seasonal variances. This is the absolute minimum stock level you are allowed to reach before you are guaranteed to run into trouble. You do not want to reach this point. If you do reach this point and your new stock hasn't arrived yet, you may consider limiting the number of items any specific customer may purchase or get in your car and go and “borrow” some from one of your other locations. If you do “borrow” from one of your other locations, remember to adjust the actual stock at that location accordingly. If you did reach the “Minimum” before ordering, make sure to adjust your “Reorder Quantity” to bring your stock levels up to the expected levels.